Lake County, Calif. September 2, 2016. – Organizers of the #LakeCountyRising fundraising effort received a generous $2,500 donation today from Edward Wallace, a Calpine employee. Wallace recently received Calpine’s prestigious ASPIRE award for his passion and dedication at work. This national award was given to three recipients across Calpine’s fleet of 84 power plants. Wallace, a resident of American Canyon, is an Operator Technician III at Calpine’s Wolfskill Energy Center in Fairfield, California. As part of the award, Wallace was given $2,500 to donate to a charity of his choosing. Lake County’s Matthew Smith was also an awardee for his calm leadership during the Valley Fire. He was on duty the night the fire swept through The Geysers area and made critical decisions, minute-by-minute during the ordeal, even as he faced the fact that his own home had been destroyed by the fire. 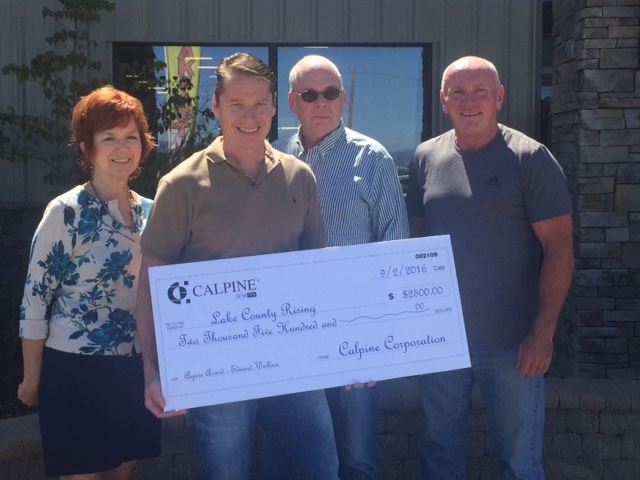 Calpine was an early supporter of #LakeCountyRising through a $15,000 initial donation and subsequently hosted a successful fundraising golf tournament resulting in an additional $15,000 donation. Kelseyville, Calif., August 15, 2016 – The #LakeCountyRising fundraising campaign announced today that it is accepting donations to support survivors of the Clayton Fire. Lake County’s wine industry is once again coming together to support yet another wildfire in Lake County, this time in the small community of Lower Lake. The Clayton Fire, which started Saturday evening, is estimated to have burned 4,000 acres and destroyed 175 structures, with 5% containment on Monday afternoon, according to the CAL FIRE incident update. #LakeCountyRising was established in September 2015 in the wake of the Valley Fire, which burned 76,000 acres, destroyed 1,300 homes and took four lives. Once again, thousands of Lake County residents are displaced from their homes by the wildfires. Many have been separated from pets and loved ones and are waiting to learn the fate of their homes and businesses. Donors who have contributed to this fund in the past are encouraged to continue their support by donating again. The #LakeCountyRising fund has raised over $1,000,000 to date. Contributions have been used to support community recovery after the devastating Valley Fire, with funds going to a wide range of community based organizations. Approximately one-third of funds raised were used to support short term needs with another third for medium term needs. The balance has been allocated for long-term community rebuilding. For details, visit http://lakecountyrising.org/giving-back/. #LakeCountyRising is a fundraising effort to support community rebuilding in the areas ravaged by the recent wildfires in Lake County with a focus on livelihood, housing and community needs. The effort was initiated by three Lake County organizations – the Lake County Winegrape Commission, the Lake County Winery Association and the Lake County Wine Alliance, a 501(c)(3) non-profit organization that manages the collection and distribution of tax-deductible donations. St. Helena, CA (March 22, 2016) – Lake, Napa and surrounding county residents joined #LakeCountyRising to raise more than $150,000 at the Charity Wine Auction on Sunday at the Culinary Institute of America in St. Helena, CA. More than 100 guests gathered for the Charity Wine Auction, among whom were Linda Reiff of Napa Valley Vintners, Cyril Chappellet of Chappellet Winery, and Clay Shannon, owner of Shannon Ridge Family of Wines. Proceeds from Sunday’s auction were generated from the event’s 10 live auction lots, 20 silent auction lots, ticket sales, and donations from attending guests and supporters. Since the devastating Valley Fire, which scorched more than 115 square miles, destroyed 1,300 homes, and claimed the lives of four Lake County residents, #LakeCountyRising has raised nearly $1 million for Valley Fire Relief. At the Charity Wine Auction, it was apparent the overwhelming support from community members and wine industry supporters continues, even six months after the fire. The afternoon opened with speakers Andy Beckstoffer and US Congressman Mike Thompson (CA-05), who commented on the deep and historic connection between Napa and Lake Counties. Focusing on the growth of Lake and Napa counties in the last 150 years, Beckstoffer highlighted the deep-rooted connection between the two counties, reminding guests that prior to 1851, Lake was actually part of Napa County. In recounting the fire’s devastation, Congressman Mike Thompson shared numerous anecdotes from evacuees and supporting community members who came together in the days following the Valley Fire’s devastation. His personal accounts of residents like Karen Cakebread, who provided meals to evacuees at the emergency shelter at the Calistoga fairgrounds, further demonstrated the joint coalition between Lake and Napa county residents. The two most popular live auction lots from Sunday included (1) “Personal Barrel Lot of 2016 Cabernet from Beckstoffer’s famed Georges III Heritage Vineyard and Crafted by Sinegal Estate”, and (2) “Taste of Napa Valley Heritage”, which included dinner for two couples with Andy and Betty Beckstoffer at PRESS Napa Valley, four magnums from Beckstoffer’s Heritage Vineyards, a selection of famed Napa Valley wines to complement dinner, and a copy of Kelli White’s Napa Valley Then & Now. After receiving competitive bids from multiple bidders, both auction lots were made available to the first and second bidders, which raised a combined $81,000 for Sunday’s event. Apart from auction lots, the event also showcased Lake County wines, poured by Aliénor Wines, Boatique Winery, Bodkin, Brassfield Estate Winery, Calvino Jones, Chacewater Winery, Fore Family Vineyards, Fults Family Vineyards, Gregory Graham Wines, Hawk and Horse Vineyards, Jelly Jar, Langtry Estate, Obsidian Ridge Vineyard, R Vineyards, Rock Wall Wine Company, Rosa d’Oro Vineyards, Shannon Ridge Family of Wines, Six Sigma Ranch, Sol Rouge and Steele Wines. A special thanks is given to notable bidders, particularly Dwight Haldan, Tor Kenward and Todd Zapolski, who greatly contributed to the success of Sunday’s event. In addition to these contributors, the event would not have been possible without the generous support of Tom Bensel, Bob Bath, and the faculty and staff at the Culinary Institute of America, including Andy Wild, who not only led the culinary team at Sunday’s event, but headed a team of chefs at the evacuation center in the weeks following the Valley Fire. #LakeCountyRising is a collaborative fundraising effort of the Lake County Winegrape Commission, Lake County Winery Association and Lake County Wine Alliance to support long-term rebuilding in response to the devastating Valley Fire. Lake County, Calif. – Congressman Mike Thompson and grape-grower Andy Beckstoffer have agreed to assist legendary auctioneer Fritz Hatton as he manages the #LakeCountyRising charity wine auction to be held on March 20, 2016, in St. Helena at the Culinary Institute of America at Greystone to support the long-term rebuilding efforts after the devastating Valley Fire in southern Lake County. “Think of us as the three auctioneers” says Hatton of the trio’s presentation of the collaborative fundraising effort of the Lake County Winegrape Commission, Lake County Winery Association and Lake County Wine Alliance. Seating for the event is limited and advance registration is required. Tickets are $150 and may be still purchased online at www.lakecountyrising.org/charity-auction, but a few tickets are being reserved for sale at the door. “We promise not to turn any bidders away!” says Beckstoffer. The auction has assembled a remarkable collection of lots and experiences, led by the Napa Valley Vintners, Lake County Winery Association and other wine region associations around the state. Winners of a Michelin 3-Star live auction lot will indulge in a dining experience for three couples at The Restaurant at Meadowood, Napa Valley. They will enjoy six sumptuous full tasting menus with wine pairings (inclusive of tax and service). Winners will also take home three bottles each of sought-after Napa Valley Cabernet Sauvignons from the renowned wineries: 2011 Harlan Estate Red Wine, 2005 Heitz Family Vineyards Cabernet Sauvignon, and 2012 Scarecrow Wine Mt. Etain Red Blend. A personal barrel lot by Beckstoffer Vineyards will provide a half ton of Cabernet Sauvignon grapes from the 2016 harvest of the Georges III Heritage Vineyard in Rutherford and includes the expertise of the winemaking team at Sinegal Estate who will custom crush, craft, barrel, age, bottle, and label the finished wine specifically for the successful bidder. Another live auction lot includes four magnums of wine from several of Beckstoffer Vineyards’ Heritage Vineyards and the opportunity for two couples to join Andy and Betty Beckstoffer at PRESS Napa Valley in St. Helena for a curated dinner complemented by several To Kalon wines. Each couple also will receive a signed copy of sommelier Kelli White’s new book, Napa Valley Then & Now. A silent auction item from the “Heart of the Valley,” includes dinner for four at Mustard’s Grill in Yountville and a mixed case of Napa Valley wine including: two bottles Far Niente 2013 Chardonnay; two bottles Joseph Carr Wine 2012 Cabernet Sauvignon; two bottles Tom Scott Vineyards 2012 Cabernet Sauvignon; two bottles Grgich Hills Estate 2012 Chardonnay; two bottles The Prisoner 2014 Red Blend; one bottle Faust 2012 Cabernet Sauvignon; and one bottle Silver Trident 2012 Red Blend. From the Napa Valley’s southern end comes a silent auction item named “Distinctly Southern” and includes dinner for four at Cole’s Chop House in downtown Napa and a mixed case of Napa Valley wine, including: five bottles Arrow & Branch 2013 Sauvignon Blanc; five bottles Jamieson Ranch Vineyards 2011 Cabernet Sauvignon; and two bottles Rocca Family Vineyards 2011 Red Blend. A “Napa Valley Cabernet Fest” is a silent auction lot which includes a mixed case (one bottle each) of Napa Valley Cabernet Sauvignon: Chateau de Vie 2009 Calistoga; Cimarossa 2011 Howell Mountain; Corison Winery 2013 St. Helena; FARM Napa Valley 2013 Napa; Faust 2012 Rutherford; Reverie Vineyard & Winery 2010 Calistoga; Lamborn Family Vineyards 2011 Howell Mountain; O’Brien Estate 2012 Napa; Joseph Carr Wine 2012 Rutherford; Silver Stag Winery 2012 Napa; Tom Scott Vineyard 2012 Yountville; Rudd Oakville Estate 2011 Oakville; and a copy of the fine art photography book Perspectives Napa Valley. Those who would like to bid but aren’t able to attend can check the www.lakecountyrising.org/charity-auction web site after March 1 for lot descriptions and advance bidding details. Those who aren’t able to attend but want to help can click the “Get Tickets” button, and then choose “Donation” instead of the “Live Auction” ticket to make a donation in any amount. Donations are tax-deductible. The Valley Fire Relief Charity Wine Auction is presented by #LakeCountyRising, a collaborative fundraising effort of the Lake County Winegrape Commission, Lake County Winery Association and Lake County Wine Alliance to support long-term rebuilding in response to the devastating Valley Fire. #LakeCountyRising would like to extend a special thanks to the communities in Napa, Sonoma and beyond for their generous support; to Thomas Bensel and the staff and students at the Culinary Institute of America; to Paul Wagner and the team at Balzac Communications; to Fritz Hatton; and to Linda Reiff of the Napa Valley Vintners Association for her guidance from the start. Lake County, Calif. – In an effort to help rebuild Lake County after the devastating Valley Fire, the wine industry community has banded together in support of #LakeCountyRising. A charity wine auction will be held on March 20, 2016, in St. Helena at the Culinary Institute of America at Greystone to support the long-term rebuilding efforts in southern Lake County. The event is presented by #Lake County Rising, a collaborative fundraising effort of the Lake Country Winegrape Commission, Lake County Winery Association and Lake County Wine Alliance. The Valley Fire tore through northern California last September, scorching more than 115 square miles, destroying more than 1,300 homes and taking the lives of four Lake County residents, making it the third most destructive wildfire in California’s history. The fire damaged numerous businesses, decimated vast expanses of forest land, and left thousands of residents suddenly homeless. Lake County grape growers and winery owners, along with North Coast industry partners, quickly mobilized to launch the #LakeCountyRising Valley Fire Relief Fund to help members of the Lake County community cope, adjust and rebuild. Since launching this campaign, the fund has received donations from across the state and beyond, raising more than $800,000 to date. While these contributions already have made a profound impact in the lives of Lake County residents, the need is still great. Community members and wine industry guests can make a difference as they raise their paddles to bid during a live auction with the nation’s leading wine auctioneer, Fritz Hatton. Napa Valley Vintners, Lake County Winery Association and other wine region associations around the state are putting together memorable auction lots in support of this important event. In addition to live auction items, attendees will be able to bid on silent auction wine lots and experiences from wine regions across California. Already lined up is a live auction personal barrel lot valued at $58,000. Beckstoffer Vineyards will provide a half ton of Cabernet Sauvignon grapes from the 2016 harvest of the Georges III Heritage Vineyard in Rutherford to the expert winemaking team at Sinegal Estate who will custom crush, craft, barrel, age, bottle, and label the finished wine specifically for the successful bidder. Attendees will enjoy light hors d’oeuvres prepared by students at the Culinary Institute of America and have an opportunity to taste Lake County wines in a walk-around tasting. Seating is limited and advance registration is required. Tickets are $150 and may be purchased online at www.lakecountyrising.org/charity-auction. $40,000 to the Middletown Unified School District to support the following programs: Sixth Grade Science Camp for students attending elementary schools in Cobb, Middletown and Hidden Valley Lake; the K-12 music program; gift cards for students impacted by the fire. $10,000 to the Lake County Fair Foundation to support Future Farmers of America (FFA) and 4-H youth programs to assist with the replacement of jackets, uniforms, equipment, tack and animal needs. $10,000 to the Lake Family Resource Center to support immediate housing and other needs of client families who lost homes in the fire. Based on an initial assessment of community needs, the steering committee agreed to distribute $60,000 of the funds raised to date to help restore some sense of normalcy for children who have suffered as a result of the fire. Many youth lost equipment, instruments, supplies, uniforms, even animals used in agricultural programs, all of which are vital to their extracurricular activities. Also at risk are other youth programs, like science camp and music programs, which require monetary support through fundraising drives in their communities – a difficult task given the devastation of the Valley Fire. In the first few days after the Valley Fire swept through the southern part of Lake County and decimated communities like Cobb, Middletown and Anderson Springs, #LakeCountyRising was established to provide a way for individuals and businesses to respond. “The outpouring of support has been remarkable,” said Debra Sommerfield, president of the Lake County Winegrape Commission. To date, more than $500,000 has been donated or pledged to the Lake County Rising Fire Relief Fund. U.S. Congressman Mike Thompson and supporters: $52,500. “Tragedies have a way of showing what a community is made of, and the Valley Fire is no different. This is one of the worst fires in California’s history, but it’s shown the absolute best of Lake County. We are a community of strength, resolve, gratitude and generosity, and that is how I know Lake County will rise again,” said U.S. Congressman Mike Thompson. Homestake Mining Company: $5,000. “Homestake has been a part of this community for over 30 years, and we are saddened by the extensive losses suffered by so many of our neighbors in Lake County. Our hope is that this contribution will provide some needed relief to those in need and encourage other businesses and individuals to help where they can,” said Peggie King, McLaughlin Mine Closure Manager, Homestake Mining Company (Barrick Gold Corporation). Cache Creek Vineyards and others: $7,250. “At Cache Creek Vineyards, we wanted to do something to help those affected by the fires so we began making plans for a benefit concert. With the generous support of many individuals and businesses who donated to our silent auction and provided goods and services to sponsor our concert, we were able to raise $14,500,” said Don Van Pelt, Owner, Cache Creek Vineyards. The proceeds were split between two funds, including the Lake County Rising Fire Relief Fund. The Lake County Wine Alliance, a 501(c)(3) organization, is managing the collection and distribution of funds for #LakeCountyRising. According to Bill Groody, Marketing Director of the Wine Alliance, more than 30 wineries, vineyard owners and other businesses have donated to #LakeCountyRising, and more than 200 individuals have supported the fundraising effort. “It’s extremely gratifying to see that what started out as a wine industry response to the Valley Fire has blossomed into a broad-based response, with donations coming in from places as far away as Alaska, Florida, New York and Washington, D.C.,” he said. As donations to the Lake County Rising Fire Relief Fund began to arrive, organizers recognized the need to establish a steering committee that could guide the distribution of funds to assist individuals, businesses and organizations where the need is acutely felt, as well as generate awareness and solicit funds beyond Lake County borders. Several prominent leaders in the local community as well as leaders from neighboring counties stepped up to serve in this capacity to help support a broad fundraising effort, particularly in Napa, Sonoma and the San Francisco Bay Area. Members of the steering committee include Kaj Ahlmann, President, Lake County Wine Alliance, and Owner, Six Sigma Ranch; Andy Beckstoffer, Chair and Owner, Beckstoffer Vineyards; Rob Brown, District 5 Supervisor, County of Lake; Elizabeth Gore, Entrepreneur-in-Residence, Dell; Peter Molnar, Partner and General Manager, Obsidian Ridge Vineyard; Brad Onorato, District Representative for U.S. Congressman Mike Thompson; Tiffany Ortega, Assistant Administrator, Sutter Lakeside Hospital. From the start, U.S. Congressman Mike Thompson and Lake County Supervisor Rob Brown have been integral in providing insight, support and on-the-ground experience for the #LakeCountyRising organizers and steering committee. From a practical perspective, the steering committee provides leadership and guidance while the primary organizers – the Lake County Winegrape Commission, Lake County Winery Association and Lake County Wine Alliance – provide “on the ground” support. This support includes collaboration with community leaders and attendance at community meetings, communicating with local agencies and maintaining the fundraising infrastructure to enable ongoing donations and distributions. Future giving will be based on an in-depth community needs assessment currently underway and identification of needs not covered by other funding sources. Areas of focus will include community-building activities to support long-term recovery efforts for the communities of Middletown and Cobb. Savings Bank of Mendocino County donated $20,000 to #LakeCountyRising. In this photo: David Weiss, SBMC Board Member; Bill Groody, Lake County Wine Alliance Board Member; Pete Dodson, SBMC Loan Officer; and Susie Robinson, SBMC Lakeport Branch Manager. Homestake Mining Company (Barrick Gold Corporation) donated $5,000 to #LakeCountyRising. In this photo: Debra Sommerfield, Lake County Winegrape Commission; Peggie King, Homestake Mining Company; Sharron Zoller, Lake County Wine Alliance; and Terry Dereniuk, Lake County Winery Association. Kelseyville, Calif. October 2, 2015. – Organizers of the #LakeCountyRising fundraising effort report that approximately $275,000 has been raised in the first 12 days since launching the campaign, which was created to support rebuilding efforts in the communities devastated by the Valley Fire. Organizers of several well-attended events – one in Washington D.C. and one in Napa this week, and one in Sonoma County the prior week – have contributed to the cause. “While we are still tallying donations from this week’s benefits, it is apparent that momentum is building for this local campaign,” said Bill Groody, board member of the Lake County Wine Alliance, one of three organizations who initiated the #LakeCountyRising fundraising effort. One of the recent events, a Valley Fire Relief Benefit organized by Michelle and Robin Baggett, owners of Alpha Omega Winery in Rutherford, in partnership with Darioush Winery, St. Supéry Estate Vineyards & Winery and the Napa Valley Film Festival, raised $100,000 with half of that going to #LakeCountyRising and half to UpValley Family Center. “We’re so grateful to see such broad community and industry support,” said Debra Sommerfield, president of the Lake County Winegrape Commission. Andy Beckstoffer of Beckstoffer Vineyards helped jumpstart the effort with a $50,000 donation, and others in the wine industry also have jumped in, from individuals to wineries to grapegrower organizations. Barry Hoffner, president of the Pine Mountain-Cloverdale Peak Winegrowers Association, a small newly established appellation in Sonoma County, was one of the first to call in with a pledge of support. “We wanted to do what we can to help,” Hoffner said. The board of the Oakville Winegrowers Association also stepped up, voting unanimously to make a donation to the fire relief efforts, according to Tom Garrett, president of the association. “Our board was compelled to contribute to the rebuilding process for Lake County and felt a local organization, such as Lake County Rising, would be best-suited for understanding the needs of the community and for keeping the majority of contributed funds in the county,” Garrett said. Kelseyville, Calif., September 21, 2015 – On Monday, September 21, 2015, Beckstoffer Vineyards announced its donation of $50,000 to the #LakeCountyRising fundraising campaign. “On behalf of the Lake County community, we are grateful for the generosity we’re seeing from across the region,” said Debra Sommerfield, president of the Lake County Winegrape Commission, one of three organizations who have partnered to establish the #LakeCountyRising fundraising effort. #LakeCountyRising is a fundraising effort to support community rebuilding in the areas ravaged by the Valley Fire with a focus on livelihood, housing, and community needs. The effort was initiated by three Lake County organizations: Lake County Winegrape Commission, Lake County Winery Association, and Lake County Wine Alliance, a 501(c)(3) non-profit organization that will manage the collection and distribution of tax-deductible donations. “This generous donation by the Beckstoffer family is a wonderful example of how the wine industry is coming together with significant support,” Sommerfield said. Beckstoffer Vineyards farms more than 1,300 acres in the Red Hills of Lake County, in addition to its 1,000 acres in the Napa Valley and 1,300 acres in Mendocino County. “We hope this will motivate other people to give,” Beckstoffer said. Kelseyville, Calif., September 18, 2015 – In response to the devastating Valley Fire, three leading organizations that represent wineries and vineyard owners in Lake County have announced plans to lead a fundraising drive – #LakeCountyRising – to help those affected by the Valley Fire. The organizations include Lake County Winegrape Commission, Lake County Winery Association, and Lake County Wine Alliance. The Wine Alliance, a 501(c)(3) non-profit organization, will manage the collection and distribution of tax-deductible donations to support rebuilding efforts focused on livelihood, housing and community needs. For information on how to support this important cause, go to Facebook.com/LakeCountyRising or follow the Twitter hashtag, #LakeCountyRising. “As a partner in this effort, the Lake County Wine Alliance brings a 15-year track record of raising a substantial amount of money and getting it to organizations that will do the most good,” said Bill Groody, Wine Alliance marketing director. #‎LakeCountyRising aims to raise significant funds over the coming weeks and months to help members of the Lake County community cope, adjust, and rebuild after the Valley Fire. #LakeCountyRising will work with local organizations and government agencies to identify the most pressing community needs.